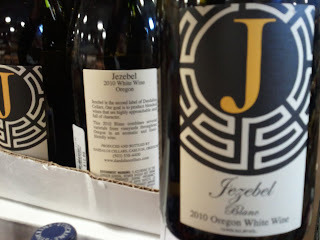 Jezebel Blanc 2009, Oregon $14.99. A beautiful & easy drinking blend of Pinot Gris, Riesling & Gewürztraminer with pleasing acidity, a touch of white flower & mineral & a plethora of ripe fruit. Drink this now on its own or pair it with something that's got some spice. This is a great wine that is available all over the Northwest at grocers and smaller retailers. Jezebel is s second label of Daedalus Cellars and winemaker Aron Hess. The wines are made in a "negociant style" which indicates that they may buy fruit or wine from various other sources, that said Aron remarks on the Daedalus website that 30 to 100% of the Jezebel wines are sourced in house. "Our goal is to blend wines that are highly approachable and full of character. Our approach to making Jezebel is completely different. We pick the grapes earlier and cold-soak them less. We use a dizzying array of cultured yeasts on these fermentations. This lends an interesting array of fruit expression, at the affordable cost of some loss in complexity. The fermentations are, of course, much shorter. While we still avoid the homogenizing effects of enzymes, nutrients and other “enhancements,” we certainly are less dogmatic about Jezebel. She aims to please, after all, and who are we to question her methods." Oh, Jezebel is another word for "floozy" by the way, so be careful if you do a google image search for this wine.